Here's the second diagram I taught at the 2016 PTN Workshops. I did not lay it out as I have done here. Today I think this diagram would have been a good handout.I could have drawn it; the participants could have followed along and had a cheat sheet to take home. 4/18/2017: this diagram is awkward. I will redraw and simplify. 3/4 5 triangles always have a 90* angle where the side with 3 units meets the side with 4 units. Draw a line and mark off your unit. 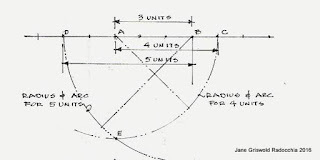 Lay out lines of 3 units, 4 units and 5 units. 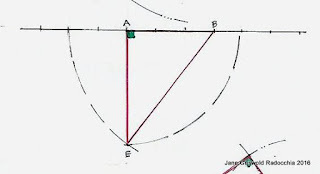 Where the arcs cross is E.
Draw lines from A to B to E to A. 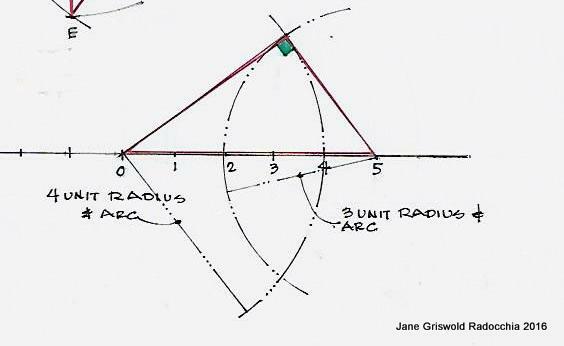 For fun I have laid out another triangle beginning with 5 units, use 3 and 4 units for the radii of the arcs. It is another 3/4/5 triangle with a 90* corner. We used Gunston Hall, built of brick by George Mason from 1755 to 1759, as an example. Mason was a real mason; he gave George Washington advice about mortar recipes. He would have used the 3/4/5 triangle when he built walls or, as a Master Mason, instructed others. The triangle was/is one way to keep brick square and true. 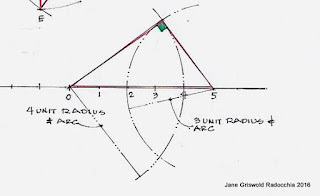 It would have been ordinary for him to use 3/4/5 geometry to design his house. The base of the brick work at Gunston Hall is 4 units. 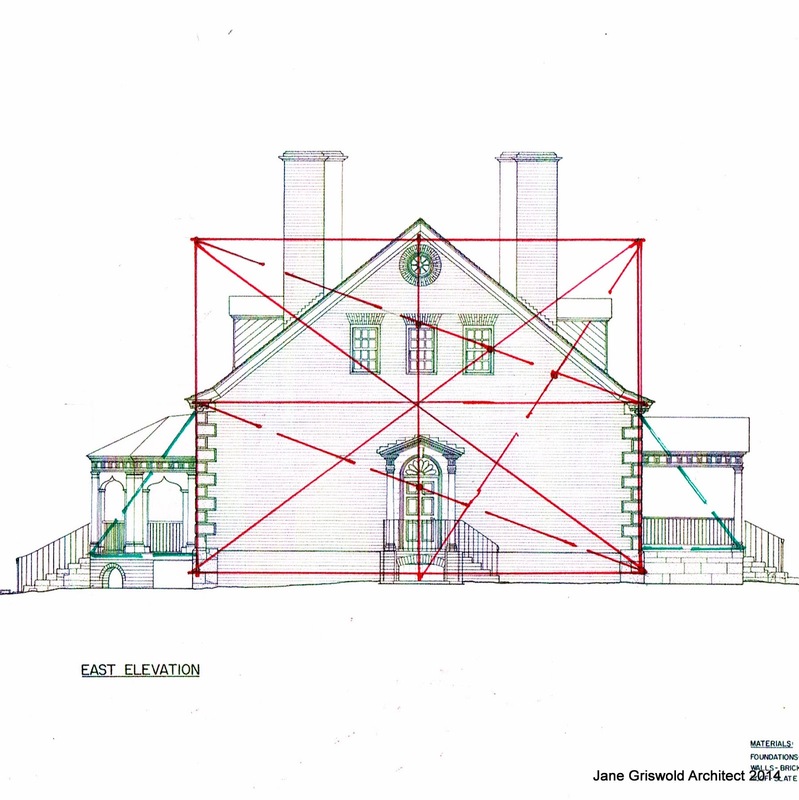 The height of the brick work of the end wall at Gunston Hall measures 3 units. The diagonal is 5 units. 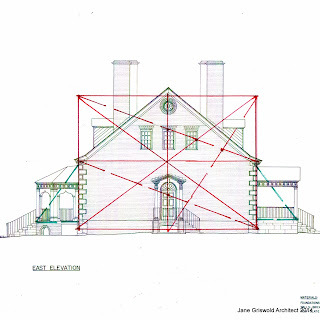 I asked the participants at the PTN session to divide the width of the Gunston Hall side elevation into 4 equal parts. I wanted them to draw the geometry for themselves, to see it come to life. Again a handout with step by step instructions would have been helpful. Not everyone knew how to divide a line into parts; but those who did showed those who didn't. It was a excellent group. 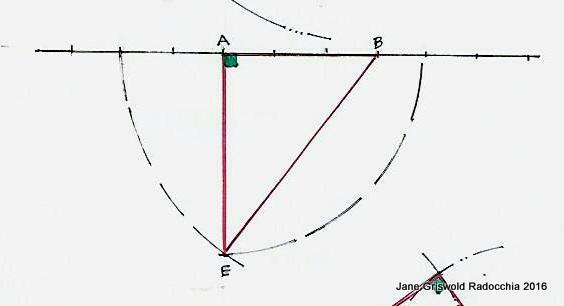 One of the first figures in the pattern books on Practical Geometry is the division of a line by a perpendicular. 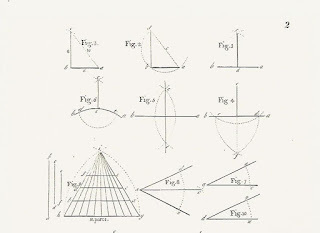 Here is Figure 5, Plate II, of Asher Benjamin's The American Builder's Companion, first edition published 1806.
with short arc lines at c, the top, to show the use of a compass to make a circle with the radius determined. 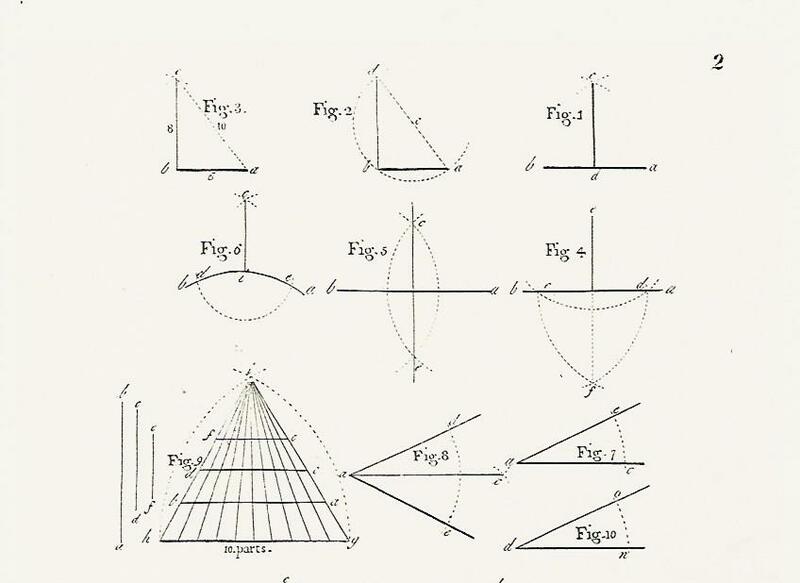 His description assumes a familiarity with the language of geometry and compasses. "To make a perpendicular with a 10 foot rod. Let b a be 6 feet; take eight feet in your compasses; from b make the arch c, with the distance ten feet from a; make the intersection at c, and draw the perpendicular, c b. "